I have been anticipating turning 30 for way too long. Some of my friends who have hit this milestone told me it was the best thing ever, and there's a big part of me that couldn't wait to leave my tortured twenties behind and get on with being a real grown-up. Obviously there were parts of me that were a little anxious about where I'm at in life, but mostly I was really excited. I like who I am, I'm proud of how far I've come in the last decade, and I was ready to celebrate. I've held a number of themed parties over the years. Starting with a murder mystery that my mom wrote for me for my 13th, I went on to host a music awards themed Halloween party in high school, complete with lip-synced performances by my friends and papier mache "Golden Pumpkin" awards. In more recent years I hosted "Gangsters through the ages", with gangster trivia, prizes, and a home-made piñata, and a blue themed goodbye part when I moved out of "The Blue House". Last year the theme was endangered species since I had made a sloth costume for my boyfriend for his birthday and I wanted him to have somewhere to wear it. Everyone dressed up like animals and we raised money for the World Wildlife Federation. I love hosting these parties. It gives me an excuse to do a ton of research on obscure topics and to make things I would never have the opportunity to do otherwise, and it gives all my friends reasons to dress up and get creative themselves. I'm so thankful for how enthusiastically they play along. This year I wanted to do something a little more special than usual, a little bit more fancy. 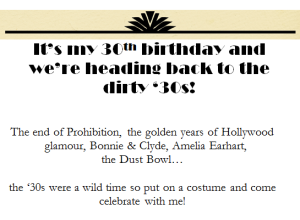 I wanted the theme to have something to do with the number 30 and the obvious choice (or at least, obvious to my boyfriend who came up with the idea in about 3 seconds) was the Dirty 30s. Because this was a milestone birthday I wanted to do more than I usually do. Costumes and a few activities wouldn't cut it; I wanted paper invitations, decorations, special food, music, dancing, the right kind of drinks, prizes, and goodie bags. And it all had to be done on a tight budget. Here's how I did it. I sent out a 'save the date' on Facebook over a month beforehand and started collecting mailing addresses. I had all kinds of crazy schemes for creating the invitation, but in the end I did what was easiest for me (though others might consider this the hard way). I traced and then painted a picture of an old car with smoke blowing out the back with the words "Welcome to the Dirty 30s'. I scanned it and used the Word templates included in the pack of invitations to put it all together. Art Deco was huge in the 30s so I looked around until I found a shape that was easy to copy and traced it out on a huge piece of cardboard that we've had sitting around for years. 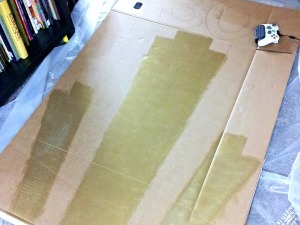 Using Dollarstore paint, I painted the gold sections first, then once they were dry I taped the edges and painted them black. I used gold glitter paint on the number 30 and attached it with wooden skewers. Once we got there my boyfriend draped the star lights (which had previously been hanging in the bedroom) over and it and the look was complete. I found peacock feathers at Michaels - probably my most extravagant purchase - and stood them up in some simple tall vases from the Dollarstore. I stuffed the vases with another pack of feathers I found, to hide the white stalk of the peacock feathers. I had gold doilies leftover from when the chocolate store I worked at was clearing out its packaging inventory, and got napkins and paper plates at the Dollarstore. To add a little touch of class I made menus to display with the food, as well as a list of cocktail recipes, and decorated them the same as my invitations. I did some extensive research to find out what might have been served at a cocktail party in the 30s. I found a great site that has photos of old restaurant menus. I was surprised to see 'celery' showing up on the appetizer list again and again. Celery? My boyfriend confirms that his grandparents always had bowls of pickles, olives, and yes, celery at their dinner table. I decided to spruce mine up a bit and stuffed some with tuna salad and some with Roquefort cheese. According to my sources stuffed foods were popular, so I also added my favourite stuffed mushrooms to the menu, and asked my friend to make his devilled eggs. 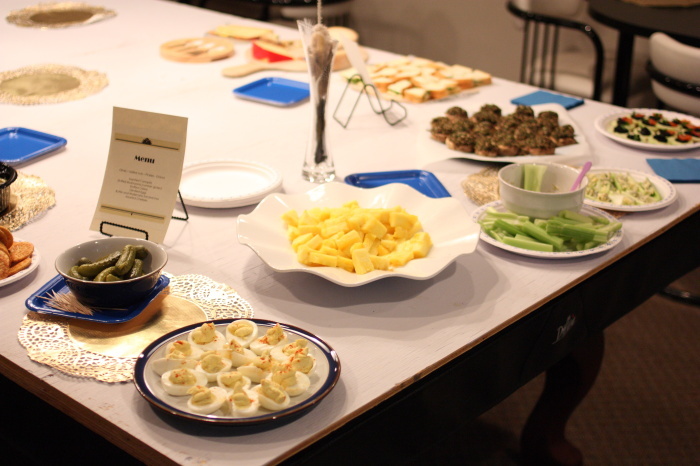 I rounded it out with some canapes with imitation crab meat and cheap caviar that I found at a European grocery store, cream cheese and cucumbers. Dessert was green jello and pineapple. I initially thought of hiring a caterer to save myself time on the day but decided not to spend the money. It was a lot cheaper to do it this way, and I was glad I could add my personal touch. I recently read The Rules of Civility, a novel by Amor Towles set in New York in the 30s. The characters were constantly drinking gin and champagne, so I decided that was what I wanted. I provided the gin, the vermouth, and a few assorted liquors from our cupboards, and asked guests to bring their favourite cocktail ingredients - which led to some interesting combinations. 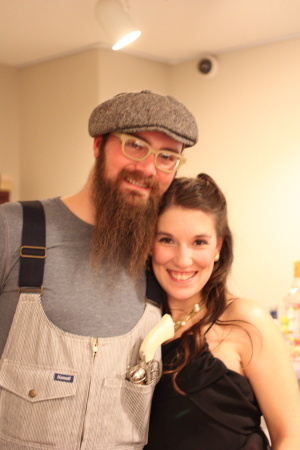 My boyfriend made batches of mint juleps and whiskey sours (completely from scratch - even the whiskey was homemade!) and served them in mason jars. These were pretty popular - every time I saw him he was running liquor around the room. I created a Pinterest board and shared it on the Facebook page to help people get inspired. I decided right away that even though there were some great female characters to choose from (Bonnie Parker, Amelia Earhart) I wanted something glamorous for this party. I searched thrift stores for something long and fluttery and found the perfect dress on sale for $3.50 - an amazing find. I found shoes that were pretty close to accurate (and ditched them in the first 30 minutes of the party), and jewellery that was flashy and Art Deco influenced. The feather behind my ear came from an assorted pack from Michaels and the fur I'm wearing at the beginning was leftover from the sloth costume. I initially wanted to fill little bags with old fashioned candy, but couldn't find quite what I was looking for. Instead I bought leftover Halloween candy on sale and picked out all the chocolate bars that started production in the 30s - Mars, Snickers, Kit Kat, Aero and Smarties. The prizes also consisted of food that was introduced in the 30s - Orangina, Kraft Dinner, and Campbell's Mushroom Soup. It helped that I could play off the Depression theme by giving my guests low-priced food. I got all the gift bags at the Dollarstore. I'm a bit of a dork and I like to give my guests reasons to interact and play a little. This time around I had a trivia contest, a dance contest, and a costume contest. For the dance contest I warmed up the crowd by reading dance instructions I found on a Wikipedia page and getting the crowd to try to interpret them. It was pretty hilarious to watch! Of course I had to blow out my candles and open a bottle of champagne too. My face in the last photo is my favourite. Based on what I've written it looks like the key to partying on a budget is to shop at thrift stores and the Dollarstore, make the food yourself, get people to bring liquor, and start hoarding supplies now. You never know when they'll come in handy! What are some of your favourite tips for throwing parties? Leave a comment below! All photos taken by Matt Whitford and Kelly Tran.